The GivePlus Mobile app allows anyone to give on their phone - wherever they are. With GivePlus Mobile your members and guests can express their generosity in the moment — right from the palm of their hand. And best of all, GivePlus Mobile is included with ALL eGiving plans. That means you pay no additional set-up or monthly fees to offer the app. Tell your donors to search for “GivePlus Church” to quickly find and download the app today!. How easy is it to set-up and make changes to the app? 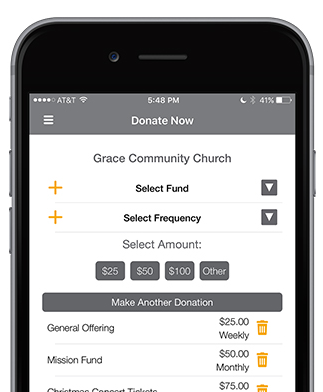 The app will initially be set up with your church’s general or default fund only. If you would like any additional funds to appear in the app, go to the “Manage Funds” screen in the MyVanco Service Center. How will donors find out about the mobile app? Just make sure they know the app is available to download and that your church supports and encourages electronic giving. Visit GivePlus' Resource Center to access a wealth of resources that can be used to create initial excitement about the app and build a plan to keep the momentum going. What payment methods are accepted with GivePlus Mobile? GivePlus Mobile supports donations via all major debit and/or credit cards you accept today, as well as ACH donations. Yes. If donors have a GivePlus account or choose to create one, they can log in and select the frequency of the transaction during the donation process. If donating to multiple funds at one time, donors can select different frequencies per fund. How quickly are donors’ GivePlus Mobile gifts processed? One-time debit/credit card donations are processed immediately. ACH and recurring debit/credit donations received before 3 pm CT Monday – Friday will be processed that day. ACH and recurring debit/credit donations received after 3 pm CT on Friday will be processed the following business day. How quickly are GivePlus Mobile donations deposited? Just like your other GivePlus donations, GivePlus Online donations are electronically deposited into your church bank account within 2 to 4 business days.